The moonflowers are starting to bloom. They've been a little off this year. Not a lot of foliage and not a whole lot of buds. 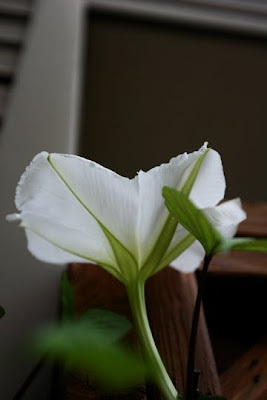 But even if I only get one moonflower, it's all worth it. These flowers are just spectacular and they have a very light fragrance. It's about 4 to 5 inches in diameter and as the night becomes darker, it will spread and open even more. These pics were taken about 6:30pm, so it had probably been open about 30 to 40 minutes. By morning it will be wilted and fading. This is actually the second one to bloom. You have to be present and aware to catch these. 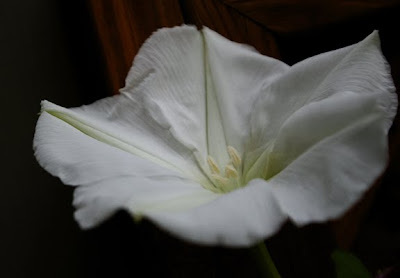 I didn't notice the moonflower that opened Tuesday night until this morning when it's time had already come to an end.